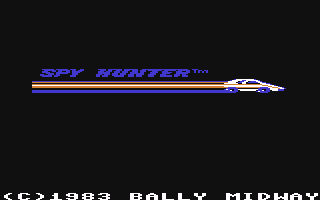 Spy Hunter is a port of a 1983 Bally Midway arcade game. The port was developed by U.S. Gold and published by Sega for the Atari 2600 and various home computers. The 2600 version was produced internally at Sega Electronics. Rights for an Amstrad CPC port of Spy Hunter were picked up by first-party CPC developer Amsoft, who advertised its existence in a January 1986 Amstrad CPC catalogue. Amsoft never managed to release any of the Sega games they had promoted, however, and while the company reaffirmed its intention to publish a CPC port of Spy Hunter in mid-1987, it did not arrive until later in the decade, when it was "re-released" by budget label Kixx. Another opportunity to release the CPC version of Spy Hunter was missed with the 1988 U.S. Gold compilation History in the Making (which includes Spy Hunter as one of the fifteen titles). A CPC version of this compilation was reviewed by some publications of the day, but also does not appear to have been released. Spy Hunter was, however, included as part of the 1989 compilation Coin Op Hits, also by U.S. Gold. The CPC version, coded by Choice Software has a 1986 in-game copyright, suggesting it was ready for release in Amsoft's original timetable. Main article: Spy Hunter/Magazine articles.